The history made by Yuri Alekseyevich Gagarin on 12 April 1961 will always be remembered as one of the most extraordinary achievements by mankind in the fields of science and technology, and space exploration. Although a lot of commemorative stamps have been issued by most of the countries around the globe since 1961, the issuance of commemorative coins has somewhat been limited. There were two commemorative coins issued in the Soviet Union to commemorate 20th and 30th anniversaries of his flight: 1 ruble coin (1981, copper-nickel) and 3 ruble coin (1991, silver). In 2001, to commemorate the 40th anniversary of Gagarin's flight, a series of four coins bearing his likeness was issued in Russia: 2 ruble coin (copper-nickel), 3 ruble coin (silver), 10 ruble coin (brass-copper, nickel), and 100 ruble coin (silver). The copper-nickel coin can be seen above. 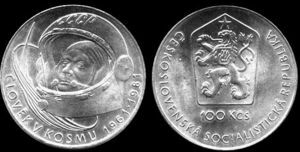 In 1981, on the 20th anniversary of Yuri's space orbital, the erstwhile Czechoslovakia issued a silver coins weighing 9 grams as seen above. The face value of the coin was 100 Czechoslovakian koruna Kčs. The unique coin above was issued by the Government of the Cook Islands. The the coin's obverse depicts the Raphael Maklouf effigy of Her Majesty Queen Elizabeth II, the 2008 year-date and the monetary denomination surrounding another coloured image of the Earth. The unique construction of the coin literally ‘orbits’ around a coloured representation of Earth. The coin comprises 1oz of 99.9% pure silver with a central core made of non-precious metal.